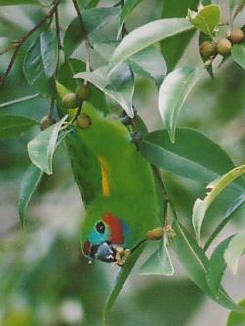 The Double-eyed Fig Parrot is Australia's smallest parrot. Their eggs are laid in holes in dead, sometimes perilously shaky, trees. Seen ideally three or four times each year around the weeping native fig trees at Lake Eacham and near Chambers Wildlife Rainforest Lodge, which set fruit and attract these parrots. Both sexes have a red forehead, but the males also have a red cheek patch, as opposed to the females' which is usually yellow. It is found in three distinct populations down the east coast of Australia from Cape York Peninsula to northern New South Wales. Unlike many larger parrots, fig parrots feed very quietly on the kernels of many tiny seeds, including those of figs, buttonwood and ironwood. In flight, they are small green round undulating rockets, with the blue in the primaries of their wings sometimes visible. When seen feeding in foliage, they are a lovely green with yellow wash on the wings and, most distinctively, red patches above and below the eyes, resulting in the common name of 'double eyed'. They have a very high pitched and vaguely metallic 'zeet ..zeet' call when flying overhead, and are often heard around even urbanized areas, such as Cairns. However, once they stop to feed, they are usually quiet and rarely seen due to their diminutive size. They do indeed feed mainly on figs, but also eat other fruits and will also take nectar (Lindsey 1998). Unlike almost all other parrots in Australia that generally use existing holes in trees for nests, fig parrots actually excavate their own next, usually in a rotting trunk (Lindsey 1998). Fig Parrots are found mainly around figs in tropical rainforest in three very distinctly separated populations along the east coast of Australia, as well as New Guinea. They will also visit figs and other fruiting trees in adjacent woodlands and even urban areas.